Follow these set-up steps for s'mores success. Only use Sterno S'mores Heat in your s'mores maker jr. Each can will provide 45 minutes of s'mores making fun! Open the can with a can opening tool and place it in the cooking fuel suspension frame. Place the roasting safety screen on top the base. Get creative with your food display! Our display is "sooo" basic. You could do so much better! Remove the roasting screen and light the s'mores heat. Time to skewer and roast. Use one of the roasting forks to skewer a marshmallow. Rotate it slowly and evenly over the flame. Seems an obvious point to make, but we're going to mention it: there's a fire in that can! Be really careful, please. We're pretty sure you've got it from here. Stick your delicious roasted marshmallow between a pair of graham crackers and on top of a chocolate bar, press, and enjoy! When you're done, invert the roasting screen over the fuel can. Leave it in place for 5 minutes to make sure the S'mores Heat is extinguished. Check out these step-by-step video instructions to use Sterno's s'mores maker jr., a safe and fun alternative to old-fashioned campfire roasting! Safco's PlanMaster Drafting Table is perfect for your work in progress! From its easily adjustable base to its durable, white melamine surface, the PlanMaster will help you finish your projects for a fraction of the cost. Check out the video for more information. 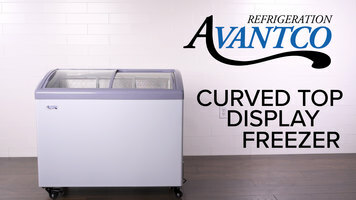 Learn about the great features and benefits of Avantco's line of glass lid curved top display freezers. See how the features of this Cambro Hand Sink Cart will help reduce food contamination by encouraging frequent hand washing for your employees! The 5 1/2 gal. fresh water tanks and the 7 1/2 gal. 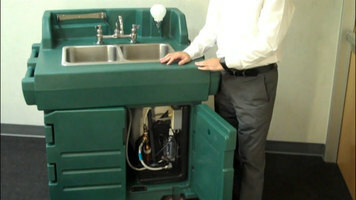 waste water tanks will allow up to 70 hand washings.